MUFF WIGGLER :: View topic - How do you make an offset? How do you make an offset? If I wanted to make +/- 5V into 0-10v how would I derive the values for the two resistors and the op-amp? essentially it is similar to what you have above but will have a second input to the amp which will be a +5 volt reference so that anything coming in has 5V added to it shifting it up. Use a pot and you have variable offset. with R1 and R2 you just sets the gain of this non-inverting amplifier. to add an offset voltage you would have to use an additional resistor (say R3) going to the node of R1-R2. don't ask me about the maths, though. i am not sure what happens to the gain then... for unity gain you would actually omitt R2 and make R1 zero ohm. i would try the following: R1=100R, R2 = 1M and feeding 5V offset via R3 = 100R to the node of R1 and R2. okay. i played a little bit using spice, and did not came up with a solution for varying input voltages. i tried both set-ups from the link above, using non-inverting amplifiers (however, maybe i missed something...). so i would follow Hi5's suggestion and use a unity gain chain of two opamps in inverting mixer setup. worked pretty nicely for me, Is that the sort of thing your after? i like daves idea of making the 2nd stage non unity in order to have unity gain at the 12o'clock position of the gain potentiometer. nice. I believe we've been through this a couple of times recently. You do not have to use two inverting opamps. Just use the formula for the generalized single-opamp summer. In this case you can use a standard difference amp with the signal feeding the (+) input and -5V feeding the (-) input. To make it accurate you can use a voltage reference chip for the 5 volts. Or you can use a voltage divider from the PS rail plus a trimmer. One issue to keep in mind is that any circuit like this will depend on having a negligible source impedance. So if you want it to work accurately for a general input signal you may want to buffer the input. So the details of the design come down to what is your source and how accurate do you want the shift to be. i just found and checked one of the old e-m threads from 2007, where you already posted about the single opamp solution. i hope i have the relevant electronotes articles on hand. do you know the EN issue# from memory? i confess, i simply can't visualize it. i will still need a resistor to GND from the negative input and a resistor in the feedback path from output to negative input? i tried that with a spice model, but failed. i used a 741 model for that. bad idea? Just use the circuit in the link I added to my first post. The signal goes to V2 and -5V goes to V1. Ian - I hadn't seen that configuration. I'd gone with the dual inverting opamp layout, as I believed that in non-inverting configuration, the inputs can interact if there is more than one of them, and the first opamp also acts as a buffer, making it suitable as a module for generalised use. I'd gone with the dual inverting opamp layout, as I believed that in non-inverting configuration, the inputs can interact if there is more than one of them, and the first opamp also acts as a buffer, making it suitable as a module for generalised use. Yes, there can be some interaction adding signals at the (+) input, but I believe that is only if you drive from a finite and variable impedance. IOW, changing one pot at the input will affect the signal from another pot at the same input. But if you drive from zero impedance, I believe this is no longer a problem. Of course, there is no interaction problem if you are adding signals together without using pots. I don't know what you mean by the first opamp acting as a buffer. The inverting opamp configuration has a finite input impedance. There's nothing at all wrong with always using the inverting configuration, and in fact you avoid common-mode voltage issues that way. But often it's easy to save an opamp by taking advantage of the properties of the general summer. Thanks for the response Ian. Impedance, resistance and their relationship to each other for me has always been the bit on the map that says "here be dragons......"
Wow...13 replies and I never received a single notification that anyone had even responded. I'll read through them all in a minute. What I plan on doing with this is making a panel for my Buchla that will translate euro (and SilentWay/MOTU) voltages into Buchla friendly ones. I could just buy some more Doepfer offsets but I have no more space for them in my euro system. The forum software is stupid like that. You aren't automatically notified about threads you start, just ones you respond to. I had the same issue recently with a thread I started in the Buchla section. there is an option in your profile settings (preferences): Always notify me of replies. works for me at least. however, it can fail from time to time. occasionally happens to me on other forums, too. Yeah, I have that set, but it never seems to notify me on threads I start, unless I reply. I'm back to thinking about this. What I'm trying to do is get my euro system and Buchla to coexist. I have a Buchla panel planned with 8 passive attenuators and 8 3.5mm to banana jack converters. I'd like to make 4 of those 3.5mm to banana converters passive and 4 active. The active ones would convert euro voltages to Buchla ones. My goal is that any voltage input will be output in the 0-10v range rather than +/- Xv. So for example an LFO that is +/- 5V will rise and fall between 0 and 10v instead. 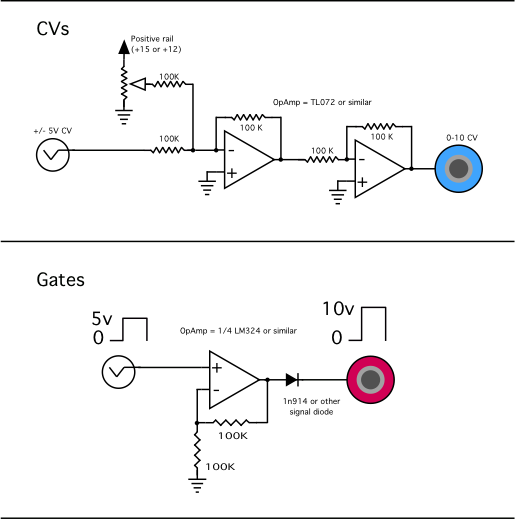 A 5v gate would become a 10v gate. That kind of thing. basically all incoming voltage would be shifted up by 5v but limited to 10v max at the output. I'd like the smallest, easiest way of doing it. I was just looking at the CGS04 mixer with trimmers in the link someone posted above but that almost seems like overkill. Though at this point I may just order the boards and move on. The CGS board is the same as the above link and the boards are tiny so if you are against perfboard/stripboard these will be ideal. there really isn't any simpler way to do this. to have 4 active converters you are looking at only 2 quad opamp chips a couple resistors and some pots if you want variable offset. pretty easy. So I would need two more resistors and a second opamp per offset 'channel'? exactly. use the summing amp to add the signal and the offset and since the summing amp inverts everything you follow this with a standard inverting amp, as you linked, to get things positive again. it is just like the cgs04 design except one of the inputs is the offset you want. Note the diode on the gate output. This is what allows Buchla gates to be freely stacked together. Don't skip it. Also note that the CV opamp needs to be powered with + and - rails, but the gate opamp is powered from the + rail and ground. keep in mind though that in chris's design the offset pot is going to the PSU rail so your offset will be double(at least) of the 5v you want. it may be worth using a voltage divider on the +V going to the pot so at the pot's maximum you only get a 5v offset.